The two day Ministerial Meeting on ‘Climate Change-Technology Mechanism that concluded on 10 November 2010 saw ministers and representatives from 35 countries, regional groups and UN organisations. The discussions revolved around the creation and operationalisation of the technology mechanism under the United Nations Framework Convention on Climate Change (UNFCC). As a conclusion of this meeting it was realised that technology development and its transfer can play a central role in addressing climate change. 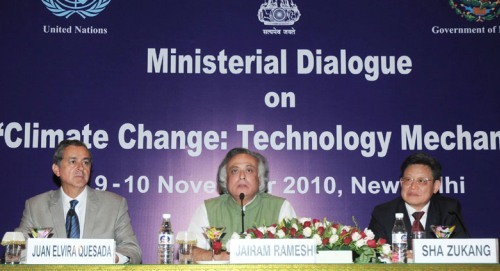 While addressing the media about the upcoming COP16, Environment Minister Mr. Jairam Ramesh focused on what was said by our Prime Minister Dr. Manmohan Singh, that “we will play our positive role of a ‘Deal maker, not a Deal breaker’. The Meeting also discussed the mandate of Bali Action Plan so as to develop efficient mechanism for the removal of obstacles i.e. financial and other incentives, which can thus contribute towards transfer of technology to developing countries and implementation. It was also felt that the technology mechanism should not only promote international co-operation for dissemination and deployment of available technology but also develop emerging technologies which address adaptation and mitigation needs of developing countries. On this, some participants expressed that both these strategies would lead to rapid diffusion of technologies in a cost effective and affordable manner. Therefore, ‘public-domain’ technologies should be the first area of focus as it would catalyze private sector activities to meet the technology needs of developing countries to address climate change. Views were also expressed on the role of Intellectual Property in the negotiations and it was realized that it is one issue that needs to be resolved soon. Considering the current scenario of discussion on this issue participants felt that it is important to reach to an agreement of technology mechanism in Cancun as well its importance to continue the dialogue on resolving the intellectual property issue at Cancun and beyond. Adding to this, Mr. Jairam Ramesh said, “Technology and finance are two essential pillars of any international Climate Change treaty. We discussed how a technology mechanism will function. We want Cancun conference to succeed and India is prepared to play a role to get constructive outcome at Cancun”. All participants and the world is now looking forward to further discussion on technology development and transfer at the COP-16 in Cancun, Mexico in November-December 2010.